Mixing mortar is pretty much like mixing cake batter. It helps to have the proper tools; it’s wise to gather up all the ingredients in advance. And, practice makes perfect! Mortar is a generic term applied to the “glue” or binder that bonds bricks, blocks and building materials together, or to adhere them to another surface such as a wall or floor. The ancient Egyptians may not have used mortar between their pyramid stones, but they did use mortar in other ways. Mosaic work bonded with mortar is found in ancient buildings as well as in contemporary applications both indoors and out. Some form of mortar binder, commonly made with mud and clay, is used even in traditional adobe construction of the American Southwest and the indigenous buildings of desert cultures worldwide. Most modern building codes specify a mortar mix capable of assuring the strength of a wall or building, but the mortar is always formulated to be the weak link in construction. It is also often the first to need repair from damage caused by the elements or passage of time. That being said, historic buildings constructed with lime mortar show amazing resilience and resistance to climatic conditions and adverse environmental effects. Modern mortar usually consists of a mix of cement and/or lime, with sand and water. A gypsum/lime mix is sometimes used, particularly for repairs to historic buildings, and mortar mixed from mud, clay and straw is still used in some areas and by proponents of all-natural ecologically-friendly construction. Ordinary portland cement mortar is generally considered too “strong” for use with natural stone, terracotta and historic brick. A common mortar mix for most purposes contains portland cement as well as Type-S hydrated lime. You can easily buy bags of mortar mix that already contain the added lime; better workability and porosity make it suitable for use with softer materials, and for some restoration work. If you plan to build an exterior wall with concrete block, you can use a mix of pure portland cement and sand or aggregate. Specialized mortars exist for use with natural stone tiles and for glass tile; they are generally available in small, premixed batches. Mortar, however, is different from grout. The proportions of ingredients are somewhat variable, but mortar should always dry to a solid state that will not crumble to the touch. While “wet,” or during application, it should be generally the consistency of mashed potatoes — soft, but able to hold its shape. Professional masons utilize a mortar board during application — a flat surface without edges that holds a batch of “goo,” and a large flat trowel. The mix must not be so liquid that it runs off the side of the board. It must be easily spreadable, but it should not “run,” even along a vertical plane. Getting it can might involve some trial and error. 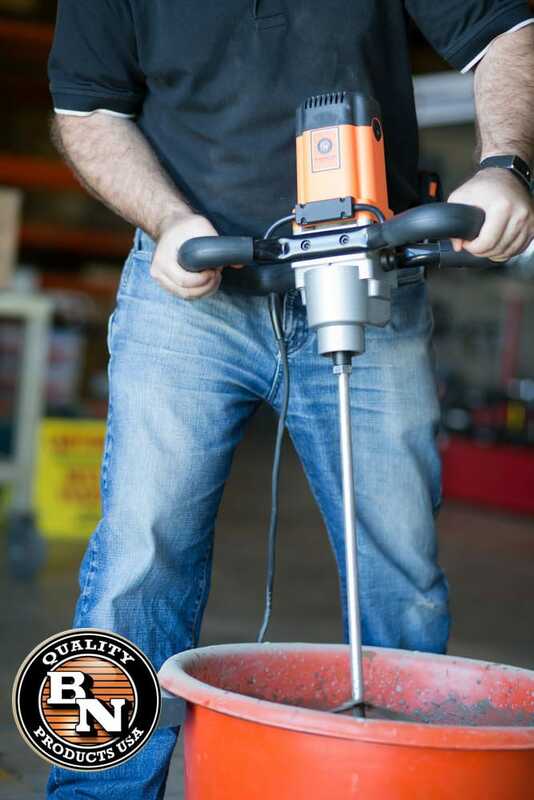 While it is possible to mix small batches of mortar by hand, anything but the smallest repair job will be made easier by using a power mixer. It’s beneficial to have interchangeable mixing paddles for concrete, mortar, paints and glazes, plaster, grout, and even fibrated aluminum roof coatings on hand. Having a variety of paddles adds great flexibility to your mixer. As mentioned, the exact ratio of the mortar mix depends on the type of job to be performed and, to some extent, personal preference. Pre-mixed mortar is simpler to use, but for large job like a block retaining wall, it is much more economical to buy bulk supplies and mix the mortar on site. A mixing stand like the portable BNMG-6100 may be worth its weight in gold if you plan multiple projects. Designed with wheels and a movable platform that allows you to adjust the height to specific needs and to mix in either a bucket or a wheelbarrow, also features an optional ramp to facilitate moving a wheelbarrow to the point of use easily, even when full. The heavy duty stand is designed to lock in place, allowing continuous mixing at a job site. It accommodates a heavy-duty 1800-watt mixer, sufficient for any size project, but it also has a variable-speed motor with a “soft-start” feature that makes it gentle enough to stir paints.